Sunday, April 14, 3:00pm. Northern California People’s Life Fund will gather at the BFUU Fellowship Hall (1924 Cedar St., Berkeley—Near North Berkeley BART) and distribute $15,000 in redirected taxes to amazing peace and justice organizations! The program includes a potluck dinner and the Granting Ceremony. For more information see, www.nowartax.org or contact nowartax@riseup.net. Saturday, April 13, 9:30am-2pm. Public Hearing by the People on the Immoral Budget & March to the Border. Event begins at Casa Familiar Civic Center (212 W Park, San Ysidro, CA). This event is the last stop on the Emergency Truth & Poverty Tour, Sponsored by the California Poor People’s Campaign. For more information, see the Facebook event page. Friday, April 12, 11:45am-1pm. A penny-poll will be hosted downtown at the southwest corner of Pikes Peak and Tejon Street. For more information, contact Mary Sprunger-Froese at firststriketheatre@hotmail.com. Monday, April 15, Noon-1pm. Annual Tax Day Military Budget Demonstration at Rodney Square, Central Downtown Wilmington (1000 N Market Street) Meet at the civic center piece. Sponsored by Pacem in Terris Delaware. Monday, April 15, 11:00am-1pm. “Don’t Pay Any War Tax Demonstration.” At Federal Plaza on the Corner of Dearborn & Adams. Will include a public act of Civil Disobedience. Sponsored by the War Resister League – Chicago Chapter. For more information, see www.wrlchicago.org. Monday, April 15, 4:30-5:30pm. Vigil at Corner of Jefferson and Main – 204 S Main Street. Sponsored by Michiana Peace and Justice Coalition (http://www.michianapeacejustice.net/). For more information, contact Peter Smith at psmith@saintmarys.edu or (574) 532-3720. Monday, April 15, 1:30pm. Rally at the Des Moines Federal Building – 210 Walnut. A petition against taxes for war will be delivered to Senators Ernst and Grassley. Petition can found here. Feel free to sign. Sponsored by Catholic Peace Ministry, Iowa Citizen Action Network, Iowa Peace Network, Methodist Federation of Social Action, Progress Iowa, STAR*PAC and Women’s International League for Peace and Freedom. Monday, April 15, 6:00-8:00pm. “Tax Justice, Where Should our Taxes Go? Presidential Candidate Forum” at Northwest Community Center (5110 Franklin Ave). Catholic Peace Ministry, Iowa Citizens Action Network, Progress Iowa, Methodist Federation of Social Action, STAR*PAC, and WILPF Des Moines have invited all presidential candidates to answer three questions, one focused on reducing military spending, one on climate crisis priorities, and one on shifting the tax burden to the wealthy. Tulsi Gabbard has committed to being there and Julian Castro will be letting them know. Other candidates have been provided the questions, with the expectation they will respond by video. Wednesday, April 17, 6:00pm. Free Screening of “An Act of Conscience” at the Belfast Free Library (106 High St.) A post-film discussion will be led by former NWTRCC Administrative Committee member Jason Rawn. Sponsored by Waldo County Peace & Justice (https://www.facebook.com/WaldoPeaceandJustice/). For more information, contact Cathy Mink at (207) 323-5160. Tuesday, April 16, 4:00pm. Let’s talk taxes! Over Pizza: Presentation, Conversation & Action at Abromson Community Education Center, Room 216. Free and open to the public, to reflect on federal budget and values. Sponsored by Peace Action Maine, with Devon Grayson-Wallace, former FCNL lobbyist and board member of Peace Action Maine. For more information call 207-772-0680 or visit the Facebook event here. Wednesday, April 17, 4:30-8pm. Tax Day March & Rally at Uphams Corner in Dorchester. About 200 people attended the rally. Speakers included the newly elected Representative Ayanna Pressley, state Senator Jamie Eldridge, peace activists Joseph Gerson, Hyatt Imam, Rev. Vernmon Walker, Kevin Peterson of the New Democracy Coalition, Vignesh Ramachandran, the new Vets for Peace leader, housing activists, and many others. Coalition effort led by Dorchester People for Peace and Massachusetts Peace Action , which included American Friends Service Committee National Alliance of HUD Tenants (NAHT) City Life/Vida Urbana Mass Senior Action Council Vets for Peace The New Democracy Coalition and about 15 other groups. April 22, from 5:30 pm to 7:00 pm, the Walpole Peace and Justice Group will hold a tax day rally as part of the GDAMS, calling for a reduction in military spending and a redirection of those funds to human services. A 40 foot budget banner will be displayed, showing where the Federal discretionary budget is spent today. The vigil will be at the Walpole Common on the corner of Main and West Streets. People are invited to attend for all or any part of the scheduled time. There will be signs available, in addition to the budget banner, or you may wish to bring your own sign. For more info contact info@walpolepeace.org. Wednesday, April 17, Noon-1pm. Penny Poll and Distribution of WRL Piechart Budget 2020 at 4 South Central Clayton. Sponsored by Women’s International League for Peace and Freedom, & Peace Economy Project. For more information, contact Chrissy Kirchhoefer at 314.660.2300 or outreach@nwtrcc.org. Monday April 15. Members of New Hampshire’s office of American Friends Service Committee met with staffers from U.S. Senators Jeanne Shaheen and Maggie Hassan in Manchester, and with Congresswoman Anne McLane Kuster’s District Director in Concord. Monday April 15, 9:30 to 11:00 am. Peace Action Bay Ridge Tax Day Action: MOVE THE MONEY!!! Every hour, taxpayers in the United States are paying $8.36 million for Total Cost of Wars Since 2001. Every hour, taxpayers in the United States are paying $2.19 million for nuclear weapons. This is unacceptable! For more info: bayridgepeaceaction@yahoo.com; (917) 579-6860 or this link. Monday April 15, noon to 1 pm. Protest Tax Dollars for War! Co-sponsors: Brooklyn For Peace; Bronx Peace Action; Code Pink NYC; Granny Peace Brigaade; Kairos Community; NYC Catholic Worker; NYC Democratic Socialists of America Anti-War Working Group; Peace Action New York State; Veterans for Peace/Chapter 34; Facebook event here. Monday, April 15, Noon-1pm. Vigil and leafleting outside the IRS office in Manhattan, 290 Broadway at Duane Street, across from the Federal Building. War tax redirections may be announced. Info: Sponsored by NYC War Resisters League, NYC Catholic Worker, Kairos Community, Peace Action NYS, Brooklyn For Peace, Veterans for Peace/Chapter 34, CodePink NYC, Raging Grannies, Pax Christi Metro New York, Granny Peace Brigade, Peace Action Bay Ridge, Bronx Peace Action, Samidoun: Palestinian Prisoner Solidarity Network, NYC Democratic Socialists of America Anti-War Working Group, World Can’t Wait. For more information: https://www.facebook.com/events/2350470898539532/ or www.nycwarresisters.org/demonstrations or call (718) 768-7306. Thursday April 18, 7-9 pm (doors open 6:45 pm). How the Pentagon Robs Our City! Then, working groups will form to plan actions. May 4 – New York: 8:30 am to 5:30 pm: Growing Nuclear Risks in a Changing world: New Thinking and Movement Building International Conference. Initiated by American Friends Service Committee; Campaign for Peace, Disarmament and Common Security; International Peace Bureau; Peace Action (New York and New Jersey); Western States Legal foundation; Peace and Planet; Rosa Luxemburg Stiftung; International Trade Union Confederation. At Judson Memorial Church, 55 Washington Square. Monday, April 15, 3pm. 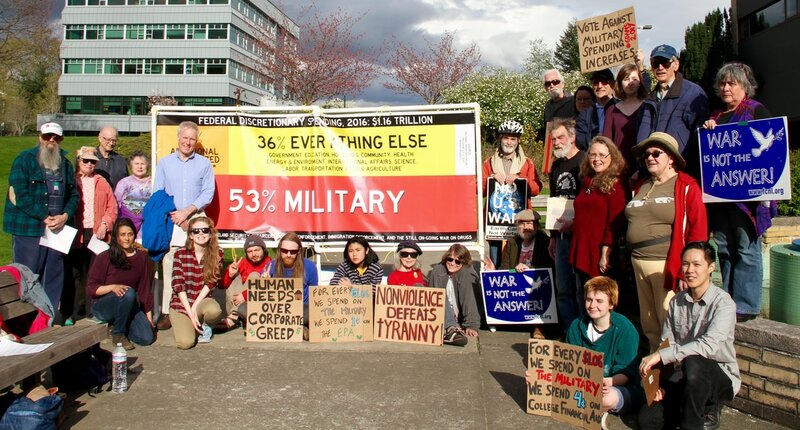 Taxes for Peace Not War, along with Community Alliance of Lane County, 350 Eugene, Oregon Women’s Action for New Directions, & Extinction Rebellion will rally at the old Federal Building at 211 East 7th Ave (location of IRS office). At 4pm they will deliver a signed letter to the IRS. Then they will march to the new Federal building at 405 East 8th Avenue to deliver copies of the letter to federal representative Peter DeFazio and federal Senators, Jeff Merkley and Ron Wyden. The event will include signs, chants, songs, and speeches. People interested in signing the letter, helping to organize the event, or needing more information can call Sue Barnhart at 541-731-1189 or suebarnhart2@gmail.com. Monday, April 15, 7:30-9am. Sign-holding on Portland bridges (Burma Shave Style). Meet at E. Burnside and MLK Jr. Blvd. Sponsored by War Resisters League – Portland. For more information, Email: jgrueschow@comcast.net. Monday, April 15, 10am-3pm. WTR Information Tabling outside of the Brattleboro Food Coop, 2 Main Street. Sponsored by Pioneer Valley War Tax Resistance. For more info, contact Daniel Sicken at 802-387-2798 or dhsicken@yahoo.com. Monday, April 15, Noon-1pm. Peace Vigil in front of the Dane County courthouse in Madison (215 S Hamilton St.). This is collaboration with Madison’s Monday Peace Vigil, which has been hosting a weekly Monday Vigil for Peace for the last 38 years. Saturday, April 13, Noon-1pm. Vigil to protest federal tax dollars for war and environmental harm, U.S. Army Reserve, 5130 W. Silver Spring Dr. Sponsored by Milwaukee War Tax Resistance, Casa Maria Catholic Worker, & Peace Action of Wisconsin. For more info, contact Lincoln or Mikel, Casa Maria at usury_sucks@hotmail.com or (414) 344-5745. April 2nd, from 9 a.m. to 5 p.m.: International Peace Movement Conference: “No to NATO, No to war Network, Yes to Peace and Disarmament. Speakers include Reiner Braun, Anna Ochkina, Medea Benjamin and Peter Kuznick. At St. Stephen & the Incarnational Episcopal Church 1525 Newton St., N.W., Washington, DC. See the agenda here and click on the image to download the full Flyer. April 17: Leafleting in New Orleans, Louisiana: Tuesday, April 17. Leafleting with the “where your income tax really goes” pie chart on a busy corner. To check time and exact location contact Pax Christi New Orleans, (504) 522-3751. April 14-16, Rome: WTR table and workshop on Organizing Against Militarism in your Community at Resources for Organizing Social Change’s Youth Activism Gathering, Pine Tree Camp, Rome, ME. Other Maine War Tax Resistance (WTR) actions will also take place around the state, read the whole document here. April 14, Bethel: at Bethel post office (to be determined). Other Maine War Tax Resistance (WTR) actions will also take place around the state, read the whole document here. April 14, Damariscotta: from 11am-1pm: Damariscotta post office (PO). Other Maine War Tax Resistance (WTR) actions will also take place around the state, read the whole document here. April 14, Blue Hill: From 11am-3pm: Blue Hill coop. Other Maine War Tax Resistance (WTR) actions will also take place around the state, read the whole document here. April 17, Damariscotta: From 11am-1pm: Damariscotta post office (PO). Other Maine War Tax Resistance (WTR) actions will also take place around the state, read the whole document here. April 17, Portland: From 8am-5pm: Table, noon-1p Downeast band Fire in the Commons and speakers, Lobsterman Park in front of the Nickelodeon Movie Theatre (rain location Portland Media Center, 516 Congress St), Portland. Other Maine War Tax Resistance (WTR) actions will also take place around the state, read the whole document here. April 17, Farmington: From 10am-2pm: UMaine, Farmington, student union. Other Maine War Tax Resistance (WTR) actions will also take place around the state, read the whole document here. April 17, Unity: From 11am-1pm: Unity College student union lobby. Other Maine War Tax Resistance (WTR) actions will also take place around the state, read the whole document here. April 17, Brunswick: From 11am-1pm: Brunswick PO sponsored by PeaceWorks. Other Maine War Tax Resistance (WTR) actions will also take place around the state, read the whole document here. April 17, Bowdoin: Bowdoin College TBA. Other Maine War Tax Resistance (WTR) actions will also take place around the state, read the whole document here. April 17, Orono: From 11am-2pm: UMaine, Orono, student union. Other Maine War Tax Resistance (WTR) actions will also take place around the state, read the whole document here. April 17, Machias: from 11am-1pm: At UMaine, Machias, Torrey Hall next to the library. Other Maine War Tax Resistance (WTR) actions will also take place around the state, read the whole document here. April 17, Ellsworth: From 11am to 2pm, action at Main St., Ellsworth. Other Maine War Tax Resistance (WTR) actions will also take place around the state, read the whole document here. April 18, Machias: from 11am-3pm: At UMaine, Machias, Torrey Hall next to the library. Other Maine War Tax Resistance (WTR) actions will also take place around the state, read the whole document here. April 21, Bangor: From noon to 2pm: Bangor Earth Day (Location TBA). Other Maine War Tax Resistance (WTR) actions will also take place around the state, read the whole document here. April, dates to be announced: Maine actions in College of the Atlantic; Ellsworth, ME; Norway coop, USM, Lewiston; Augusta. Other Maine War Tax Resistance (WTR) actions will also take place around the state. Download the outreach flyer (4 pp). The Walpole Peace and Justice Group, founded in 1981, is a group of citizens committed to promoting peace and justice in the community and the larger world through education, study, witness, advocacy, and action. For more information contact info@walpolepeace.org. April 17: Portsmouth, New Hampshire: Members of Seacoast Peace Response and Occupy New Hampshire Seacoast braved Sunday’s cold to conduct their annual war tax Penny Poll in Market Square, asking people what they felt were important areas in which to spend federal tax dollars. The Penny Poll asked everyone to choose how they want their tax dollars spent. It used a large display board with containers in which to distribute 10 pennies that are provided by the group. The spending options included veterans’ benefits, environmental protection, transportation, housing, military, nuclear weapons, arts and humanities, agriculture, education and child care, and health care. Look at the photo! May 3, event in Schenectady: Women Against War, located in the Capital District of New York State in the US, is holding an event in connections with GDAMS. We were encouraged to plan something by a recent speaker, Miriam Pemberton of the Institute for Policy Studies. Location: Central Ave. (Route 5), 500 feet west of Mather Avenue. Read here for more information! April 17: Vigil and leafleting in New York City: Tuesday, April 17, Noon–1 p.m. Vigil and leafleting outside the IRS office, 290 Broadway at Duane Street, across from the Federal Building. War tax redirections may be announced. Sponsored by NYC War Resisters League (http://nycwarresisters.org/demonstrations/), Granny Peace Brigade (list in formation). Click “going” on the Facebook event page (https://www.facebook.com/events/1701742596586262/) or for more info call (718) 768-7306. Download a pdf document with a photo collage! Tax Day 2015, Portland, Oregon. April 17: Tax Day Action in Seattle, Washington: At the Federal Building (915 – 2nd Ave), Seattle, from 11am – 1pm – Organized by Veterans For Peace, Chapter 92. Look at the photo here! April 11, from 10am-3pm: University of Southern Maine, Portland, Student Union with a polar bear. Other U.S. events and actions, coming soon! Tuesday, April 4th from 10am to 6 pm. Saturday, April 15 at 1 pm. Tax Rally. About 3,000 people attended the demo in Cambridge Common, emceed by State Representative Mike Connollly.